It is currently fashionable for those of a leftist disposition to blame Margaret Thatcher and ‘neoliberalism’ for poverty, inequality and all the problems of mankind. 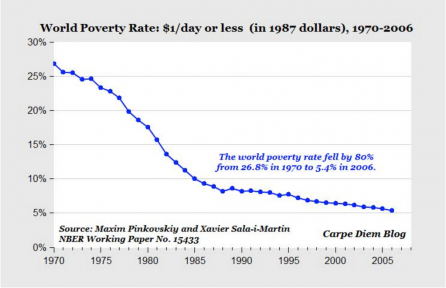 But all around the world real poverty is in decline as people empowered by free markets become better-off. In the UK the Thatcher governments, frequently derided as enemies of the poor, actually have a pretty good record. Low income families are better off now than thirty years ago and would be a lot worse off if Britain was still a socialist country. By poverty of course, I mean real poverty, living on the breadline. I do not mean inequality. As the Iron Lady herself ably demonstrated; if you believe in equality above all else then it doesn’t matter if the poor are made poorer, as long as the rich are cut down to size1. Everywhere that free markets have displaced wrong-headed socialist policies, poverty has been driven into retreat. Over 1 billion people have been lifted out of extreme poverty since 1990. The number of people living on less than $1 a day has been cut in half2. Go back to 1970 and the reduction is even more astounding. The world poverty rate has fallen by 80%3. This improvement has been driven almost entirely by globalisation, free trade, and the spread of free markets. Driven by the relentless growth of China, India and Brazil, even relative poverty has declined globally over the last 20 years4. Meanwhile, the global middle class (people who earn or spend $10-100 dollars a day) is set to expand to 3.2 billion people by 2020, nearly doubling in size5. Of course a large proportion of humanity remains mired in destitution6. Let’s not get cocky. 2 billion human beings still live on less than $2 a day. But we must be honest about how best to help them. Can anyone honestly say Cuban socialism has been more successful than Hong Kong’s free-wheeling capitalism7? Or Stalinist North Korea a better place to live than free market South Korea8? In Latin America, Chile is far wealthier than Venezuela9: where the dearly departed Hugo Chavez left his people mired in poverty, shortages and social unrest. In China, economic growth only really picked up after pro-market reformers10 quietly overturned the country’s self-destructive Maoism. We should also learn from our own history. 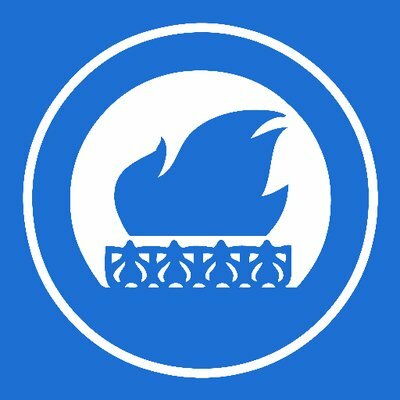 After World War II, a Britain shattered by Nazi bombs and heavily indebted to the United States embarked on a three decade love affair with socialism. The Labour government of 1945 nationalised vast swathes of industry, created the NHS and expanded the welfare state. Fast forward thirty years. Entire regions had become dependent on heavily-subsidised zombie industries. The British economy flat-lined as our standing in the world plummeted. Militant union barons cut off the power and brought down governments. The only thing going up was the rate of inflation, 25% in 197511. It took the harsh medicine of Margaret Thatcher to restore the sick man of Europe to health again by restoring control over the money supply, privatising most of the industries Labour had nationalised, and cutting taxes to a degree not seen before or since. It was tough going: initially both unemployment and inflation rose. 364 economists condemned her policies in the Times in 1981. But the Lady was not for turning, and her persistence was rewarded. Inflation fell to single digits for most of the 80s. The union barons fell in the Miners Strike. Unemployment steadily fell, but never again reached the artificial lows of the 60s and 70s. The economy went into a long period of boom, and proved resilient against the downturns of the early 90s. Consider the alternative. Industries with no future on permanent life support. An economy locked into a downward death-spiral. If we’d carried on down that path of ruin all of us would be far worse off today. Thatcher’s legacy is often criticised. The conventional wisdom is that poverty got worse during her premiership. Indeed, relative poverty shot up. But so did the poverty line itself. If you use a fixed measure of poverty instead of a constantly shifting one, then poverty actually fell from 1982 to 198812. Similarly, real incomes for the bottom ten percent have risen steadily in Britain over the course of the last half century. But because the incomes of the wealthy have risen faster, relative poverty statistics show an increase in poverty, which is simply misleading13. Those in poverty in 1945 were truly desperate. Their equivalents in Britain today have better food, better houses and better clothes. Not to mention smart phones, cars, television and the internet. How many of these innovations would have come to pass without the global free market? My guess is few to none. All over the world, poverty is in retreat before the forces of enterprise and free trade. Yet free markets are frequently derided by people who think using the word ‘neoliberal’ a lot makes them look intelligent. Capitalism, the ‘Occupy ‘set tell us, makes the poor poorer and the rich richer. These claims are demonstrably untrue, as I have shown. But the ‘inequality’ agenda is popular. It’s language is spoken by well-respected charities like Oxfam as well as preening unwashed poseurs like the comedian-activist Russell Brand. It’s increasingly-discredited bibles – Thomas Piketty’s Capital14 and Pickett & Wilkinsons The Spirit Level15 – are among the most read economics books of our time. You might as well tear up those books and use them for toilet paper. The evidence is in and the lesson is clear. Socialism cannot deliver the goods. The free market can, and does so spectacularly. The enemies of capitalism need to grow up and accept that. The best thing any government can do to relieve poverty is to get out of the way of the free market and set people free to unleash their potential. 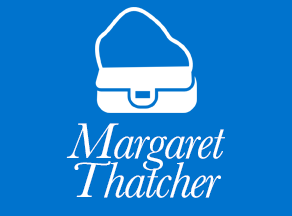 If you care about actually improving the lot of the poorest, be a Margaret Thatcher, not a Hugo Chavez. Sadly, socialism is the politics of envy so no lessons will ever be learnt. It is quite simply a case of, ‘You’ve got something I haven’t so it should be confiscated by the state’.